May use snap dragons if no white stocks available. Choose from 4 sizes. 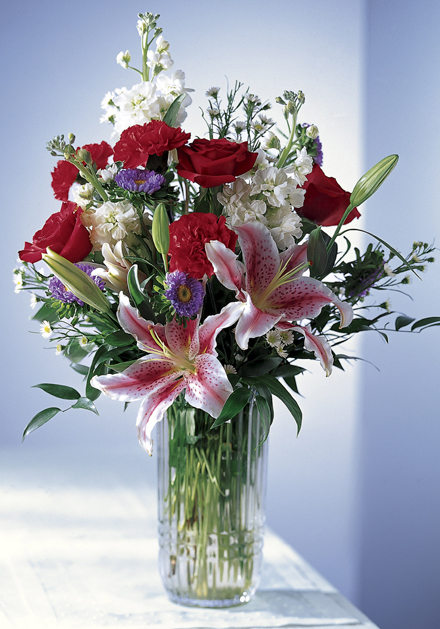 Florist Notes: Pink Stargazer lilies are the featured stars in bouquet. Arranged in a glass vase and accented with roses, carnations, asters, and other blooms, this bouquet brings a sweet wish.to their door. Arrangement Details: Available add ons include some helium balloons, a box of chocolates or a teddy bear. Hand made. Hand delivered. Guaranteed to please.